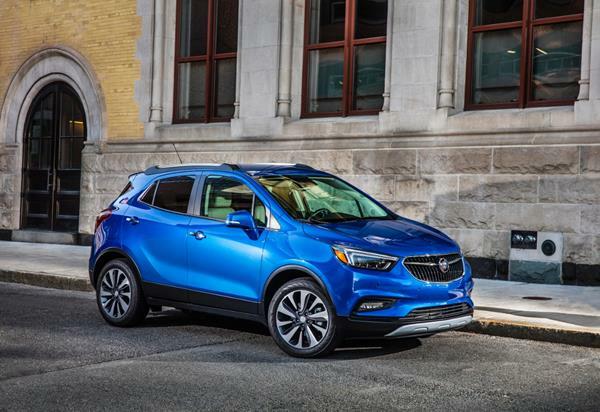 The 2017 Buick Encore is newly refreshed, but largely the same as it has been for a couple of years. This means it has an excellent interior, great ride quality and good versatility - all the things it's been known for. 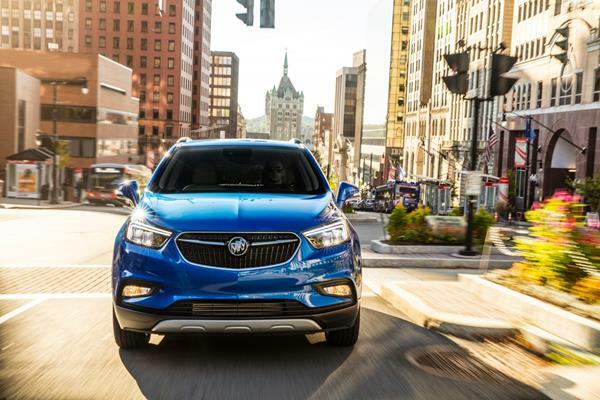 Holding to the Buick name, the Encore has a smart interior and excellent drive dynamic to go with its tiny size. The Encore is a compact premium crossover that seats up to five. There are six trim levels and either front-wheel or all-wheel drive is offered. Two engines are also on tap, both based on a true-performing 1.4-liter 4-cylinder. Its standard automatic transmission is one of the smoothest you'll ever experience. New for this year on the Encore is a revised front fascia, a few trim level details and an upgraded interior to include better materials and a more ergonomic driver's experience for controls and gauges. In all, the 2017 Encore is one of the best premium crossovers we've driven this year. The Buick Encore has a unique look that isn't too far from the beaten path for this segment. Most ultra-compact crossovers tend to have a crushed look, looking sandwiched with as much height as they have length. The Encore is no different, but the 2017 model does have some flair to its bodywork to help it stand out. The front fascia is dominated by a large bumper presence in hopes of looking bigger than it is, with a smaller grille up top and a thin intake below. Some onlookers will note the large bumper and get the impression that the Encore is bigger than it is, but others might also see the small intakes and realize that they mean a small engine too. The flat hood with its simple dimples and angular humps to either side don't help the small engine impression, but they do bring a bit of bling to the 2017 Encore's style up front and help match the slightly bulging and angled headlamps. From the side, the 2017 Buick Encore has a wide pace due to the wheels being far out to the corners, especially at the rear. A small, but open-appearing greenhouse and simple bone lines to denote forward movement for the body panels aid the Encore's overall look. The sloping roofline and fast clip for the rear finish that look. The 2017 Encore has a good look overall, for the segment, but as noted, the vehicles in the tiniest of the compact crossover segment as a whole have a generally smashed look due to their small footprint and need for a higher ride height and large enough interior to be usable. One of Buick's hallmarks is with premium-level interiors done with simple materials and excellent workmanship. The 2017 Buick Encore exemplifies that with one of the better interiors we've seen in the premium segment. It's so well done that it holds its own when pitted against some luxury-level competitors. One of the upgrades for the 2017 model year in the Encore is with its interior landscape. A new instrument panel and some improved materials use have meant a lot to the Encore's overall appeal from the inside. This goes with highly comfortable seating and a lot of small storage spaces for gadgets and gear. In the back seats, things are tight - as is expected in this segment - but the taller height of the Encore pays off with better headroom than might be expected. If the people up front aren't too tall, then tall folks will be fine in the back. The payment for that extra seating room comes from the cargo space. The Encore's cargo area is limited to just 18.8 cubic feet with the rear seats up and 48.4 with them folded. These are about average for the compact SUV segment, but far short of best sellers in the premium-level category (higher trim models). It is nice that the 2017 Encore has a fold-flat front passenger's seat though. Something not often seen in others and that adds a new dimension for stowage. Technology in the Buick Encore is based on the IntelliLink interface, a Buick-branded version of General Motors' infotainment. Standard in the 2017 Encore is an 8-inch touchscreen with OnStar, 4G LTE for WiFi, and more. The touchscreen has smartphone app integration and more. Most will find that this system is easy to use, fast in response and very likable. It doesn't take long to master the IntelliLink interface and the clear, high-resolution screen makes finding menu options on the go easy. The fact that all of this is included in the base model Encore is another reason to give the Encore a second glance. 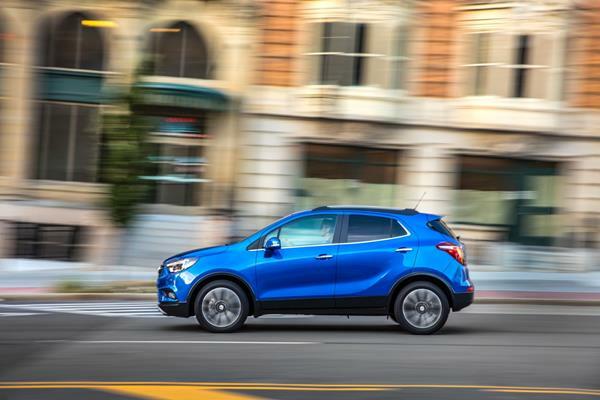 Compared to others in this segment, the 2017 Buick Encore's fuel economy returns are nothing to get excited about. Barely average for the segment, the Encore's base engine in front-wheel drive returns 25 mpg in the city and 33 mpg on the highway (per the EPA) for 28 mpg combined. AWD drops those numbers a bit, returning 26 mpg combined (23 city, 30 highway). The upgraded engine has slightly better numbers at 27 mpg in the city and 33 mpg on the highway. All-wheel drive is standard with the upgrade. 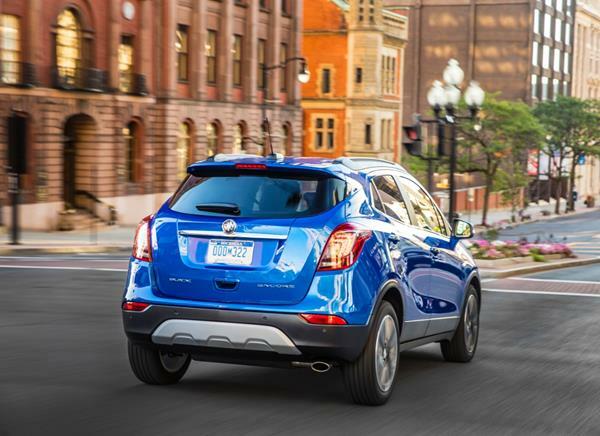 In the real world, we drove the Buick Encore with the upgraded engine and all-wheel drive. In that configuration we saw an average of 26 mpg in overall fuel economy after a couple 100 miles of mixed driving at high altitude. That isn't as good as we'd expect for a turbocharged engine in a vehicle this small. The 2017 Buick Encore is part of a generation of the vehicle that has enjoyed a good reputation for reliability. The J.D. Power and Associates Vehicle Dependability Study rates the Encore as "Better Than Most" for expected reliability. There has been one recall associated with the Encore for airbags. The 2017 Buick Encore has received top marks for safety. In all but the rollover test from the National Highway Traffic Safety Administration (NHTSA), the Encore received five out of five stars. It received four stars for rollover. This gives the Encore a 5-Star overall rating from the NHTSA. The Insurance Institute for Highway Safety (IIHS) has similarly given the 2017 Encore a top score of "Good" for all of its crash testing, including roof strength. The Encore is available with a lot of safety equipment as well. In standard format, the Encore comes with a lot of airbags, including front knee and rear side airbags. OnStar is included with automatic crash notification and more. A rear parking camera is also standard equipment. Higher trim levels have blind-spot warning and rear cross-traffic alert as standard. The Premium trim level has advanced active safety such as lane departure warning and crash mitigation as standard. The 2017 Buick Encore has two engine choices. The base engine is a 1.4-liter 4-cylinder engine that outputs 138 horsepower and 177 foot pounds of torque. An 8-speed automatic transmission is standard and front-wheel drive is the norm. All-wheel drive is available with this engine in upper trims. The base engine is enough to motivate the little Buick well, but starts to struggle when steep on-ramps or heavy passenger/cargo loads are involved. At highway speeds this engine will require the transmission to shift regularly in order to keep the vehicle moving at speed. The automatic is smooth and quietly unobtrusive - another Buick hallmark. The upgraded engine is the same one but turbo-boosted to 153 horses and 177 lb-ft. The same transmission and all-wheel drive are used. With this engine driving becomes much more enjoyable. Especially under load. The Encore virtually sprints out of stop lights and jumps into the fast lane for passing. It's a great little engine for this crossover. Added to that is the Encore's basic excellence in engineering. Steering is well done, not too sloppy and not too heavy. Handling is excellent with good suspension tuning to absorb the road while allowing plenty of feedback for engagement. The 2017 Buick Encore is a joy to drive around town and does well on the highway too. It's nimble and easy to maneuver in tight spaces with good visibility for the driver. The starting price for the premium-level 2017 Buick Encore is very reasonable and includes a lot of equipment. Most buyers will not need all-wheel drive, but the jump to that drivetrain is not steep. A well-equipped model in the upper trim tiers can be had for $25,000 with AWD and more, making this one of the better deals in premium crossovers. Resale for the Encore is difficult to assess but has generally been good for the segment. AWD models tend to hold value more than do FWD options and the engine upgrades are always a good idea for value retention. Most competitors to the 2017 Buick Encore are from less premium brands with higher tier points that are competitive in terms of packaging. Those include the excellent Mazda CX-3, which we consider very competitive to the Encore in most every way. The Fiat 500X is also competitive, though not quite as premium at its top point. The Honda HR-V offers more interior space, but a less premium feel to its interior and overall drive quality. In our assessment the 2017 Encore stands alone in terms of premium appeal, value and excellence on the road. 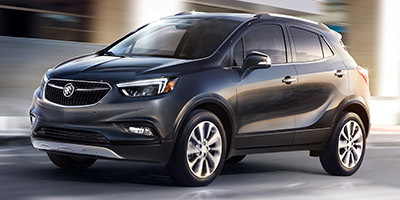 This is a tiny crossover whose purpose is to be compact and versatile while delivering the ride quality and interior excellence Buick is known for. The Encore definitely makes that grade. Interested to see how the 2017 Buick Encore ranks against similar cars in terms of key attributes? Here are the 2017 Buick Encore rankings for MPG, horsepower, torque, leg room, head room, shoulder room, hip room and so forth.